A helping hand can be a slap in the face. Recently the Supreme Court delivered a much needed ruling against race based decision making. The decision was a rebuke to the misguided “empathy” of Supreme Court nominee Sonia Sotomayor. The ruling stems from a case in 2003, when a group of firefighters were administered an exam for department promotions. When the results were released, the city “threw out the results of the tests after no black firefighters scored high enough to be promoted.” Judge Sotomayor agreed with the city. However, Sotomayor did far more than issue a baseless ruling…she perpetuated a stereotype that continues to plague minorities across the country. Sotomayor gave credence to the demoralizing belief that minorities are to be considered less than their white counterparts. The idea that minorities are not smart enough to compete on the same level. Instead, society should allow minorities a five minute “head start”. After all, we expect them to fail. Being Mexican American, I reject Sotomayor and her supporters who gush empathy for minorities. I take offense at the notion that a test must be modified or weighted to a lesser extent because of my race. The humiliation is comparable to watching your peers complete an exam while you wait for the “other” test to arrive. The only thing more humiliating would be if they gave minorities a box of crayons to use. While the rebuke of Sotomayor is not expected to derail her nomination, she should be mindful of the misguided views she inadvertently promotes. There is no dignity for minorities in being the “token” employee. Rather every minority should demand an end to race based decision making. Only then will society give what has long been sought by minorities… equality and respect. "We are closely monitoring the Voter ID bill and are fervently committed to advancing a Voter ID bill. We are all strongly encouraging Chairman Todd Smith and the other Representatives on the Elections Committee to present a bill which protects the integrity of the electoral process, is fully implemented at the next possible uniform election date and ensures a reasonable period of advanced registration to allow voter registrars the time to protect the integrity of the registration process as well." "On Tuesday, many Texas House Republican Caucus members issued a statement calling for four principles to be included in the Voter ID bill. While I, too, stand strongly behind these key elements, I chose not to add my name to the statement. As a member of the Elections Committee, my focus remains to advance this bill to the House floor. I will not sign a commitment that threatens to kill the bill by preventing it from being voted out of committee and which undermines the many long hours we have worked to send it to the floor so that my colleagues will then have the opportunity to cast votes for these important principles. My fervent commitment to advancing a strong and effective Voter ID bill has not waivered. One can simply look at the Voter ID bill that I filed, HB 3556, to see where I stand on the issues. " Lt. Gov. 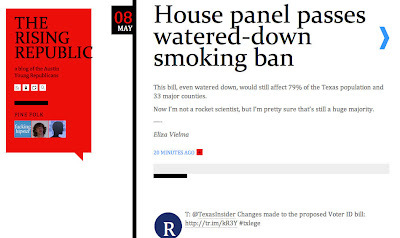 David Dewhurst testified on Tuesday, April 28 in favor of the anti-freedom, anti-property rights, pro-big-government statewide smoking ban legislation. In the meantime, Dewhurst has allowed extremely important bills (the informed consent bill, the franchise tax exemption bill, and taxpayer protections for property tax payers) to linger indefinitely in committee. We can see where the Lt. Governor has placed priorities this session, and it isn't in the taxpayers' best interests. Call Lt. Gov. Dewhurst today and urge him to get back on target now! His state office number is 512 463-0001. You can also e-mail him by clicking here. You're in College AND a Conservative?